The Crimson Tide continue to top the rankings, posting dominating performances through the opening three weeks. Alabama is fresh off a squash of Ole Miss, thumping the Rebels 62-7. Alabama has always been – and will always be – built on defense, but with quarterback Tua Tagovailoa under center, this Crimson Tide offense is equally as impressive as the stop unit. Bama is averaging 56.7 points per game – tops in the land – while allowing just 9.3 point against – eighth lowest in the country. The Aggies have also shown balance on both sides of the ball this year, sitting 21st in both points for and points against entering Week 4. However, the only true test was a slim loss to Clemson in Week 2, falling 28-26 but covering as 12-point underdogs to the Tigers. Texas A&M needs to jump start its pass rush and put the Tide’s QBs on their heels. Alabama has one of the strongest offensive lines in the country, and the Aggies can’t allow their opponents to get comfortable with the football. Texas A&M has the run stop skills to slow down Alabama’s ground game and will force Tua and Jalen Hurts to win this one with the pass. The Longhorns are coming off a statement win over Southern California and now are getting more than a field goal from state rival TCU, after this spread opened Horned Frogs -2.5. The win over USC looks good on the resume, but the Trojans are not as strong as Texas Christian and don’t pose near the threat on offense as Gary Patterson’s squad. 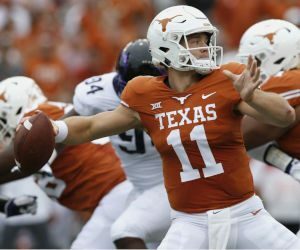 The Horned Frogs have owned the Longhorns in recent meetings, with TCU a perfect 4-0 ATS in their previous four meetings. Texas Christian hung tough with Ohio State last week, putting a scare in the Buckeyes until finally succumbing in the fourth quarter when their depth was truly tested. The Frogs are incredibly tough to game plan for on defense, with dual-threat QB Shawn Robinson able to make something from nothing when plays break down, and running back Darius Anderson erupting for 154 yards and two scores against a very good OSU stop unit. Texas Christian is also very opportunistic on defense and shuts the door on third down, allowing opponents to convert in just 25.5 percent of those chances. This game has seen some major line moves, with Oregon opening as a 2.5-point home favorite and that spread crossing over to Ducks +2 after it was announced that Stanford star running back Bryce Love would be ready to go after suffering a knee injury. Love, a top-tier Heisman hopeful, sat out Week 3’s game against FCS UC Davis and Stanford finished with a 30-10 victory – failing to cover the 31-point spread. Love rumbled for 136 yards rushing against USC in Week 2 and put up 147 yards and two touchdowns against Oregon last season. The Ducks have a lot to work out defensively after watching some less-than-dangerous opponents put up points in their first three games of 2018. Oregon is still learning under second-year defensive coordinator Jim Leavitt, and may try to turn this game into a shootout. Oregon is an offensive-minded program and putting up almost 52 points per game this year. The total for this Pac-12 matchup is set at 57.5 points and these teams have gone Over the total in 10 of their last 13 meetings.